Hot Toys continues to expand the “House Party Protocol” and are delighted to officially present the sixth scale collectible figure of one of the uniquely designed Iron Man suits fromIron Man 3 – Sneaky (Mark XV)! This armor earns its name “Sneaky” for its cloaking system that can allow it to enter stealth mode and camouflage itself within its surrounding. 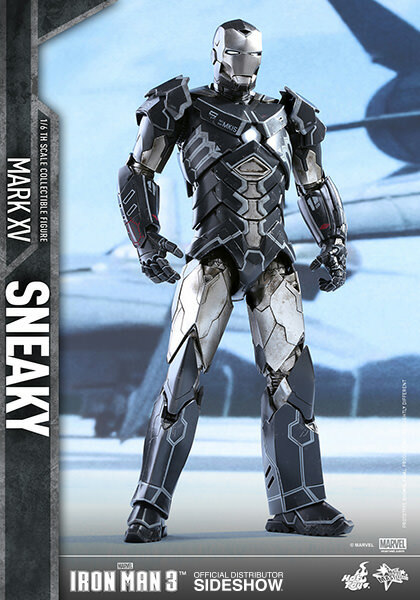 The Mark XV collectible figure features meticulously crafted armor that captures the suit’s unique and original design, a specially applied bluish-black and silver paint scheme on armor with decals and weathering effects throughout the whole body. LED light-up functions are found on the eyes, arc reactor, repulsors, and left forearm, and a dynamic figure stand is included, perfect for aerial poses. Now is the time to add a new member of the “House Party Protocol” to your Iron Man collection! © 2016 Marvel. © 2016 Hot Toys Limited All Rights Reserved. PCS Blanka Exclusive does not sell out.